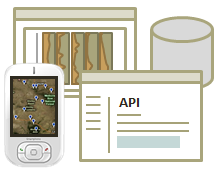 Tools/Visualization: desktop and web applications for data ingest, display, discovery, analysis, and distribution. Links to External Databases: echange of catalog metadata among databases, change management, integration with bibliographic databases. Software Development: web services, Application Programming Interfaces (API), component libraries, and documentation for remote programmatic access to the database.